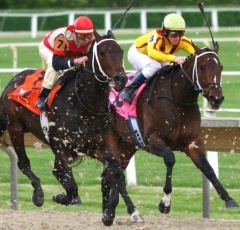 Mike?s Original Bleeding Powder is the premier nutritional supplement for equine bleeders. This enhanced version is the result of twenty (20) years of track testing and formula improvements to deliver the most complete nutritional supplement for hemorrhage problems. It contains a special blend of human grade bioflavonoid (rutin), Vitamins C & K, B6, B12, as well as blood builders including iron, copper, cobalt and folic acid to regenerate red blood cells which are most important to replace in horses that bleed. 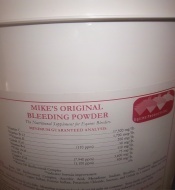 Mike's Original Bleeding Powder works to help strengthen capillary walls through its unique combination of bioflavonoid, vitamins and blood builders to reduce the incidence of exercise-induced pulmonary hemorrhage. Feed one two (2) ounce scoop daily. Measuring scoop enclosed. Keep lid tight on container. Store inside and keep out of the sun. To ensure this product?s nutrients are efficiently absorbed, it is highly recommended that bran be fed no more than twice a week. Cobalt (Co) (110 ppm) 50 mg/lb. Iron (Fe) (7,940 ppm) 3,600 mg/lb. Copper (Cu) (1,100 ppm) 500 mg/lb.